Originally released 14th May 1982. The original version of this review was published on April 1st, 2007. 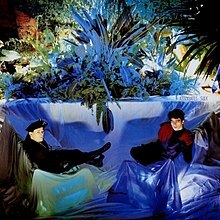 The Associates (Effectively Scottish duo Alan Rankine and Billy Mackenzie) improbably scaled the charts with their darkly luscious trio of decadent roundabouts Party Fears Two, Club Country and 18 Carat Love Affair during the brief, wet British summer of 1982. Prodigiously talented and inspired by Scott Walker, Bowie and the traditionalist soul/funk backlash against the utilitarianism of post punk, their hasty and ill advised split shortly after the record’s release and Mackenzie’s subsequent death over a decade later only served to underline the tragedy of their unfulfilled potential. Their second album, “Sulk” was the moody spy film soundtrack you assume David Lynch might have produced if he’d come from the north east of Scotland and developed his unhealthy obsessions with all things European. Essentially noir-ish pop but shot through with mendacious charm and louche idiosyncrasies, Sulk oozed sophistication one second and naiveté the next, taking the listener to tiny smoke filled backrooms where spotlighted flames sung torch songs to despair. Mackenzie’s operatic wail was an instrument in itself, creating an air of bleak classicism and controlled melodrama which you’d wager he would’ve achieved singing a shopping list. Like an impish doppelganger of ABC’s Martyn Fry, Mackenzie offered an enticingly crepuscular vision where the boy didn’t get the girl but willingly instead joined the bad guys; It’s Better This Way was grinding, bone-dry white funk and the epic Party Fears Two the euphoric sound of love cut with malign paranoia. Puckishly, the Scot re-imagined Donna Summer’s Sweetest Hangover, splicing it’s kitsch with desperate menace whilst 18 Carat Love Affair was propelled by a cheesy Pulp-esque throwaway keyboard riff and found the singer at his most Wagnerian. Dealing in a rich, multi-textured parallel universe, the downbeat, self explanatory Gloomy Sunday and the even more melancholy No were slate grey, shot through with regret and despair, whilst White Car In Germany was a more than credible kraut-Goldfrapp B-side. A truly unique piece of work harking back to more soulful days when music was written with the performer’s specific talents in mind, that Sulk was an anachronism on release doesn’t mean it shouldn’t still crave your indulgence now. Like a box of chocolates you mustn’t have on a chaise lounge you shouldn’t recline on, it preys on your weaknesses with the offer of guilty pleasure. Dive in.